We’re down to our last investment article about SOI standard. The Pro Tour starts in less than 24 hours, with the standard portion just a few hours after that. Today I’ll be talking about everything else left in standard that I didn’t cover in the first 2 articles: Multicolor, Lands, and Colorless cards. Before starting though, I just want to talk about Eldritch Moon. The foreshadowing in Shadows Over Innistrad was so obvious that it’s hard to say that an Eldrazi of sorts DOESN’T show up in the next set. Even if it ends up being some kind of “Lovecraftian” monsters instead, there is a really good chance that these monsters will be colorless/devoid and thus positively effect the value of other powerful colorless cards (namely the Eldrazi) that can be played together in a deck like GR ramp. It’s just a theory of course, but it’s what I’m going to base my predictions on. Let’s take a look at how my picks did last time. Dragonlord Ojutai – HIT. I thought $13 was a pretty good deal for her, and luckily she’s seeing play in both Esper Dragons and UW Midrange at the moment which bode well for Ojutai’s value. It’s currently at $17 but could go up more if the decks perform well. Dromoka’s Command – HIT. It’s only inched up a little bit so far (from $3.25 to $3.75) but I think there is still a lot of time for this card to spike again before it rotates in the fall. GW humans, GW Megamorph, and GW Tokens all show promise and the card is great against many decks. Jeskai Ascendancy – HIT. It was bulk at $.50 last time but is up to $.75 now. Still a good long term target like I said before. Sanctum of Ugin – HIT. Up to $1.25 from $1. Slow but steady gains slowed down even more by Eldrazi ramp decks being unable to stop aggro. Shrine of the Forsaken Gods – MISS. Everybody thought ramp cards would be safe from rotation, but until players revise the deck list to deal with aggro demand is going to fall. Down $.25 to $1.25 from last time. Lumbering Falls – HIT. Thanks to decks like Bant Company using it, Lumbering Falls is seeing some play and is up $.50 to $2 from $1.50. Conduit of Ruin – MISS. This was my longshot and I wasn’t too impressed by it but it still had some potential. Closing back in on bulk now. I did alright with my picks last time, but nothing went up too much. Ojutai was a good call, but others you wouldn’t have lost out on if you waited until now to invest in them. As people start to divest from Hangarback Walker and look for another all deck utility card, I think they’ll consider Endless One ($2). The card still has potential in a UR Eldrazi deck alongside Eldrazi Mimic, and it could show up in an aggro deck like GW counters with Avatar of Resolute as well. I don’t think it will be a fast gainer, butit shows potential. Best case scenario it will hit $4 this summer, but most likely it will inch up to $2.50. If you needed ANY reason to play cards that produce colorless mana in your deck, here it is. 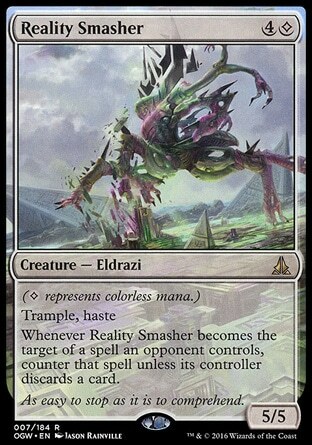 Reality Smasher is a beast and a beating. It is both an aggro power house and an anti-removal finisher. It plays a number of roles, and has shown up in quite a few decks which has me wondering why it’s only $4.75. While it’s not as common place as a card like Sylvan Advocate, Smasher still sees play in Mono red Eldrazi, BW Eldrazi, and a variety of Eldrazi ramp decks as well. I think one of these Eldrazi decks will put up some good results over the next few weeks and it will solidify Reality Smasher as a quality finisher in SOI standard. I think the card can easily hit $7 after a month or two before the next set comes out. You know what? I kind of like Blight Herder ($.75) right now. It still has a long standard life ahead of it, and with lots of exiling effects (Dec. in Stone, Silkwrap, Anguished Unmaking) available, it should have no problem giving you value when you cast it. It might not see play this summer, but could see play in the next set. Ayli has turned into somewhat of a key card in a variety of decks. In Aristocrats she acts as a sacrifice outlet, in BW Midrange she’s an early blocker that acts as removal later on, and in BW Eldrazi she starts out the curve of the deck. She’s usually a 3 of in decks that play her, which make her somewhat desirable in standard. At $2 I find her somewhat undervalued. Although Ayli is a Legendary creature, the demand is there to push her value up. She won’t hit Advocate levels of $7-8, but $4 is more than reasonable for this card. Now’s a good time to grab some for your decks. 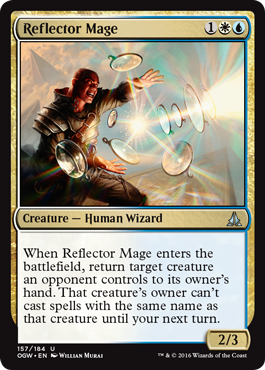 I usually don’t talk about uncommons in these articles, but Reflector Mage is simply too powerful to pass up. With Bant Company becoming the de-facto removal spell of Bant Company, UW Midrange, and UW Humans, this card still has some space to move upwards. It’s $1.50 now, but it could easily reach $3 like Monastery Swiftspear did when it saw peak play. If you have any plan to play a UW based deck, grab some copies now to save yourself a few dollars. 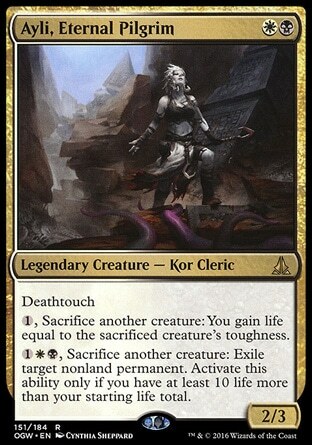 Jori En, Ruin Driver is only a 1-2 of in UR Goggle decks, but that deck has legs and I think it will see a decent amount of play. This should in turn push Jori En up to about $2 from $.50, but because she was the Game Day promo I don’t think her price will go up that much. I’d also keep an eye on Omnath, Locus of Rage ($2). Most of the popular removal these days is sorcery speed (Declaration in Stone, Ruinous Path), and instant speed removal doesn’t always hit it (Ultimate Price). I really like how it’s played so far in decks with Mina and Denn ($.50) and I think it could become a good finisher in non-eldrazi ramp decks, perhaps even alongside cards like Gitrog Monster. The picture might be of the M15 version, but it’s still the same card. 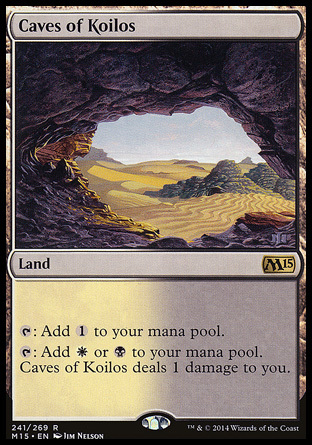 I expect Caves to be one of the most popular pain lands this cycle thanks to BW midrange/Eldrazi/control. If you’re holding on to extras and want to out some of them, give it a month or two and you should be able to sell at double its current price, or around $4-$4.50. The other cards will show up, but I don’t think they’ll see as much play as Koilos does. 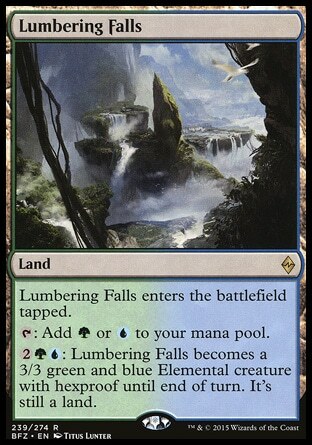 It won’t hit $5 like Shambling Vents did, but at $2 I think Lumbering Falls still has the ability to go up. Thanks to Bant company, it will probably hit $3-4 within a month. Shrine of the Forsaken Gods ($1.25) and Sanctum of Ugin ($1.25) are still pretty cheap but if Eldrazi ramp decks manage to figure out how to beat aggro decks you can be sure there will be a resurgence of players that will want to make the deck and need a playset of each of these. I think the chances are still pretty high, and I expect the prices to inch upwards to $2 before Eldritch Moon is release. Needle Spires ($1.50) haven’t seen much play at all, but I think once cards like Nahiri get solved we’ll see more RW control decks that could use them. Naya also has some potential, but an optimized deck hasn’t been made yet. The other man-lands have been trending upwards, and I think it’s only a matter of time before Spires does too. Invest in a playset at this value and you won’t be sorry. Pro Players have had a little over a month to pour over the cards from Shadows Over Innistrad and they’ve had a chance to playtest and brew for hours on end without break. Most of us have day jobs and can’t do the same, so you can be sure they’ve been able to dig deeper and push decks a lot harder than most of us have been able to to since SOI went legal. I’m sure there will be one or two decks nobody has considered yet, and we’ll definitely see some cards spike after the Pro Tour this weekend. I feel pretty confident in my choices this time around, and I think the complexity and depth of the metagame will allow more cards to shine than normal. Don’t expect the Pro Tour to be the end all of SOI standard, it’s just the beginning. We’ve only just begun.